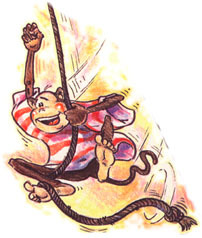 Swashbucklers, originally published as a series of children's books in three sets of six books each, Jib the Pirate Monkey, Wilf the Cabin Boy, and The Crew. The comic world of Swashbucklers follows the mad antics of a band of misfit pirates, a backwater island garrison lead by a very determined pirate catcher... and a monkey! The initial concept being more in the tradition of Asterix or Lucky Luc these original books have proven, and remain, very popular with children (of all ages). They are especially popular in schools where the books were distributed as part of an early reader incentive program. With an already established following the world of Swashbucklers has fantastic potential... about to be unleashed! Ready for reprint of the classic originals, or primed for the creation of a new series. Ripe opportunity for adaptation into an animated cartoon series for children's television for the right production company.